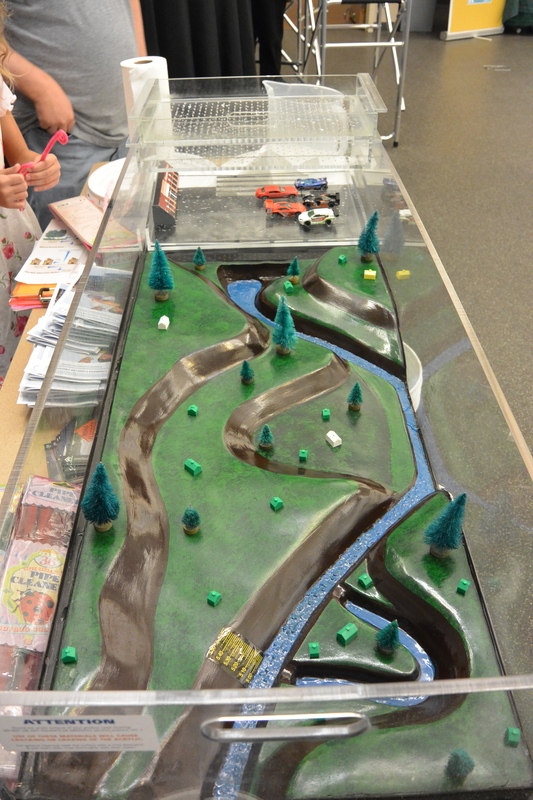 The stormwater floodplain simulation system is a large scale and visually striking model featuring a clear acrylic tank, a colorful resin land form insert, three different headwater trays and two rainmaker trays to simulate several real world environmental scenarios that students can recreate and modify. schools around the nation—and it’s no wonder. This new model offers a real opportunity to educate children and adults alike about the dangers and impact of development and human activity in the floodplain. There are numerous experiments possible with the model that can be easily tailored to fit the age and education level of the students. • Create an experiment that will flood an entire town and cause homes to float away! • Most importantly, they will work as a team to find and test solutions to a variety of floodplain problems simulated by the model.